Review: BLADE RUNNER 2049 | FLICKS. RIFFS. AND OTHER BITS. FLICKS. RIFFS. AND OTHER BITS. Talking movies, music and other close encounters of the social media kind. Out of all the movie masterpieces, BLADE RUNNER was the one movie I DID NOT want made into a sequel. So, when I first heard the announcement that a sequel to Blade Runner was going to be made – I rolled my eyes. God here we go again. Another re-boot. This time it was going to be called Blade Runner 2049 – to be produced by Ridley Scott this time round, with Denis Villeneuve in the Director chair, (he also directed Sicario and Arrival) starring Ryan Gosling and Harrison Ford, reprising his role of Rick Deckard from the original 1982 film. Villeneuve, Scott, Ford and Gosling discuss the Blade Runner sequel. You do not mess with a classic like Blade Runner. Even Ridley Scott failed with the two recent Alien re-boots Prometheus and Alien: Covenant. And Harrison Ford in the last Indiana Jones movie wasn’t such a great idea (Even though he did alright reprising Hansolo in The Force Awakens). But then I revisted the original 1982 Blade Runner on a special ‘Eat the Film’ evening at the Roxy Cinema (which I will cover in a later blog), and was again reminded how brilliant that first film was. And when Blade Runner 2049 opened this week to rave reviews from film critics (94% rating on movie website Rotten Tomatoes) – I just had to go and watch it. (Note if you’re going to see Blade Runner 2049 and haven’t seen the 1982 version – it might pay to see that one first to get a better idea of what it’s all about). The film is set 30 years after the original film and the gritty, rain-drenched streets of Los Angeles is still looking a helluva lot worse. Picture perfect Ryan Gosling plays LAPD Agent K, a Blade Runner sent out to ‘retire’ older model replicants and goes on a cold case assignment to put together the missing pieces of a massive puzzle, which involve more replicants, a steaming pot, ecological fallout, artificial intelligence, the lead singer of Thirty Seconds to Mars, Carrie Underwood from ‘House of Cards’, Vangelis music, dream implants, origami, a wooden horse, a hidden secret, Coca-Cola neon lights, Elvis Presley and a lot of snowflakes. Ultimately the answers lie by finding Rick Deckard – the original ‘Blade Runner’, played by a grissly-with-age but always capable Harrison Ford. First of all, this movie is a visual masterpiece. Every shot is breathtaking to look at and just begs to been seen on the silver screen. If Roger Deakins doesn’t win the Oscar for best Cinematography next year – they should just can the Oscars altogether. Also, best you watch ‘Blade Runner 2049‘ on the biggest screen you can find with the best quality sound. The Roxy Cinema has Dolby Atmos Digital 7.1 Surround Sound which literally shook me out of my seat at times. But in a bloody good way. There are some great action sequences but the languid and deliberate (and it’s very deliberate) pacing may drive some people to go on ‘Skip Ad on YouTube Mode’ and lose their paitence. And at 2 hours and 45 minutes, Millenials and Generation Zedders with attention spans of a snapchat video may find this tough going. Some of the dialogue is mere waffle at best (I’m looking at you Jared Leto) but on the whole – I didn’t mind this at all. Remember. This is Blade Runner. Not Blade. If you’re expecting a Fast and Furious type action thriller – then you’re in the wrong place. This is neo-noir at its finest. And I’m not talking about The Matrix either. It’s definitely one of the best looking, slow-burn movies that I’ve seen. With jaw-dropping set pieces it’s a visual treat for your eyes, holding your attention just enough that you simply get caught up in the grand design of it all – soaking in the beautiful imagery among the sparse dialogue. Director Denis Villeneuve definitely takes his time here, and the movie is all the better for it – channelling the deliberate pace and composition of Stanley Kubrick’s films that he made in the late 60s and 1970s such as 2001: a Space Odyseey & The Shining. There’s also nods to Steven Spielberg’s movie A.I. The movie really makes you feel like you’ve entered into another world. Like you’ve fallen into a hypnotic dream state of a dystopian future. Above: Blade Runner 2049. Below: Los Angeles 2019 from the 1982 film. The film does play off on similar riffs that made the original film a science fiction classic (the neo-noir tone, the neon-lit cityscapes, the hunting down of replicants) but there are definite differences in tone and mood. The world of ‘2049’ is much broader in scope and more brutal – with locations going beyond Los Angeles and out to the desolate ecological wastelands of San Diego and Las Vegas (where there’s a great scene but that’s all I’m going to say). Plus the updated music soundtrack is phenomenal. Where the first film had an almost magical, dream-like quality within the dirt and darkness, the 2049 soundtrack riffs off that, using the main elements of the original score and adding a thunderous synth/drum soundscape that not only soars with intensity, but also rumbles through your seat with the Dolby Atmos Sound system. Great work Hans Zimmer (there’s that wonderful man again) and Benjamin Wallsfisch. But if I had to be really nit-picky, it could’ve done with a bit more editing. And while it’s a gorgeous looking film – it’s not as great as the first one. But it comes pretty damn close. I’m sure Blade Runner 2049 will become a cult classic just like the original, with repeated viewings over time. Film blasphemy aside, overall Blade Runner 2049 is a masterful movie. If you can handle the long duration and slow-burn pace you’re in for one magnificent visual joy-ride. Grand in scope and beautiful in design – this movie is the reason why I love going to the movies in the first place. Hell, it may even be the best film I’ve seen this year. 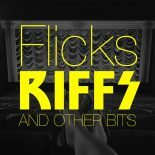 This entry was posted on October 7, 2017 by Flicks, riffs and other bits. and tagged BLADE RUNNER, Blade Runner 2049, Harrison Ford, Hollywood, movies, Ridley Scott, Ryan Gosling.